Sources have told that bin Laden was buried at sea, and I found out it is being reported as such!!! Are you EFFIN' KIDDING! The excuse is the adherence to Islamic law -- which doesn't seem to matter much when the missiles fly in and devastate families and villages. Wouldn't you -- in this rare case -- PRESENT the BODY for ALL the WORLD to SEE to ERASE ANY DOUBT?!! Talk about DESTRUCTION of "evidence!" This ranks right up there with the mutilation of Kennedy's car and body and the removal of the steel from New York after 9/11. The stuff is EVEN LEADING the SPORTS CHANNELS so you KNOW the PROPAGANDA OPERATION is operating at MAXIMUM CAPACITY! It was a nice film; however, this real-life script has obviously run its course. I guess the U.S. knew where to go digging. That means no more phony video and cryptic audio (actually, he might be able to speak from beyond the grave). Or maybe a seance would work. First question: Why did you name your terror group the toilet? Who knows, maybe they will resurrect him (but don't lose him, that would set a horrible precedent for prophecy) or he will reincarnate like Zarqawi, Baghdadi, Awlaki, and so many other phantom patsies? What a coincidence that bin Laden is dug up (literally) just as the public is fed up with the wars? Yup, we are winning and we can't stop now. I watched Obama's disgusting six-minute announcement and he seemed out of it. He stumbled several times reading the telepropmpter, and said something about wreckage in Pennsylvania (I didn't see any. did you? All I saw was a hole in the ground). He then droned (pun intended) on and on with the war rally rhetoric. The operation is being described as a U.S. special forces raid inside Pakistan on Sunday. People are cheering outside the White House, and even the sports channels are carrying the crawl (so you know the propaganda operation is in full mode). So they had the dead guy's body on ice and are trotting it out now, huh? All so the propagandist-in-chief can extol the unity and singleness of purpose after 9/11 -- before the veneer of lies began to fall as fast as those three trade center towers? Or is there another terror attack on the way as we are warned to remain vigilante? Say something like this to be blamed on them? Oh, btw, Muslims didn't do 9/11; Israel (and their dual-national, double-agent allies in the AmeriKan government) did. The corporate controlled media is currently undertaking one of the largest mind control operations in history. People are now scaling trees and waving American flags outside the White House at 12:30am on a Monday morning. This is literally IMPOSSIBLE if this was not preplanned. Update: 9: 26pm pacific: People are now scaling trees and waving American flags outside the White House at 12:30am on a Monday morning. This is literally IMPOSSIBLE if this was not preplanned. Update: 9:06pm pacific: CNN is now fear mongering over the possibility of Al Qaeda retaliating. This is a major distraction/psi op on the American people. People are now gathering outside the White House as if they planned on being there. This is outright ridiculous! A DNA test for identity takes a minimum of 48 hours in a lab. It doesn't even look like him! 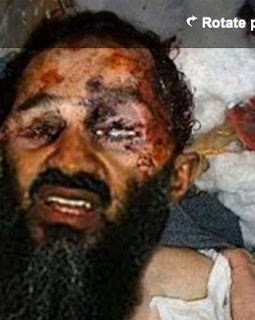 Photo of dead 'Osama' reported to be found on website from last December??????????? And it has been photoshopped? US special operations forces killed Osama bin Laden yesterday in a firefight at a compound in Pakistan, ending a massive military manhunt that began a decade ago after the Al Qaeda leader directed the largest terrorist attack in US history. As word spread across Boston last night that Osama bin Laden had been killed by a US military strike, family members of 9/11 victims expressed relief, while ebullient college students took to city sidewalks with noisemakers and American flags. Sometimes I seem like a prophet, don't I? It's all over radio and media today. Even the local news broadcast when I went to get today's Globe (when am I going to stop doing that) was all dead guy, all the time. (AP) Doctors in southern China were planning to perform surgery on a 1-year-old boy whose parents took him to a hospital because he had been unusually fussy and learned he had six sewing needles in his body, newspapers reported Monday. The child's parents, migrant workers from southwest China, said they had no idea how the needles ended up in their son, nicknamed Xiao Yu. The Beijing Youth Daily ran a color photo of an X-ray showing five needles throughout the boy's torso. The Beijing Morning Post printed close-ups of the X-ray, plus another that showed a needle that had apparently been pushed through the top of the child's head. The photographs showed the needles completely embedded inside the boy. "We have to perform the surgery as soon as possible, but we cannot promise that we can remove all the needles," the doctor, Gu Yong, was quoted as saying. The parents said they took Xiao Yu to a hospital on June 2 after he cried for three or four nights in a row and ate less than usual. An X-ray taken there revealed two needles inside the boy's chest. He was sent for surgery at another hospital, where a second X-ray revealed four more needles _ two in his scrotum, one in his head and another in his abdomen. The parents, who work at a bag factory in southern China's Guangzhou city, said no strangers have come into contact with the boy. Pakistan's opposition leader Benazir Bhutto was assassinated on December 27, 2007 Thursday in a suicide attack that also killed at least 20 others at the end of a campaign rally, aides said. "The surgeons confirmed that she has been martyred," Bhutto's lawyer Babar Awan said. A party security adviser said Bhutto was shot in neck and chest as she got into her vehicle to leave the rally in Rawalpindi near the capital Islamabad. A gunman then blew himself up. "At 6:16 p.m. she expired," said Wasif Ali Khan, a member of Bhutto's party who was at Rawalpindi General Hospital where she was taken after the attack.Her supporters at the hospital began chanting "Dog, Musharraf, dog," referring to Pakistan's president Pervez Musharraf. Benazir Bhutto was a Pakistani politician. Bhutto was the first woman elected to lead a post-colonial Muslim state. She was twice elected Prime Minister of Pakistan. She was sworn in for the first time in 1988 but removed from office 20 months later under orders of then-President Ghulam Ishaq Khan on grounds of alleged corruption. In 1993 Bhutto was re-elected but was again removed in 1996 on similar charges, this time by President Farooq Leghari. Bhutto went into self-imposed exile in Dubai in 1998, where she remained until she returned to Pakistan on October 18,2007 after reaching an understanding with General Musharraf by which she was granted amnesty and all corruption charges were withdrawn. On the same day(18-10-2007), her homecoming parade in karachi was also targeted by a suicide attacker, killing more than 140 people. On that occasion she narrowly escaped injury. Like the Nehru-Gandhi family in India, the Bhuttos of Pakistan are one of the world's most famous political dynasties. Benazir's father, Zulfikar Ali Bhutto, was prime minister of Pakistan in the early 1970s. On 18 December 1987 she married Asif Ali Zardari in Karachi. The couple had three children: Bilawal, Bakhtwar, and Aseefa. Benazir Bhutto was the last remaining bearer of her late father's political legacy. Bhutto thought that she experienced a lot of gender discrimination as the first Muslim woman Prime Minister. She felt that, many of the Muslim religious leaders believed she had taken a man's place. This criticism based on her gender was something she found very difficult to deal with. Ms. Bhutto is the author of "Foreign Policy in Perspective" (1978) and her autobiography, "Daughter of Destiny" (1989). She received the Bruno Kreisky Award for Human Rights in 1988 and the Honorary Phi Beta Kappa Award from Radcliffe in 1989.She has been mentiond as "The world's most popular politician" in the New Guinness Book of Record 1996. The "Times " and the "Australian Magazine"(May 4, 1996) have drawn up a list of 100 most powerful women and have included Benazir bhutto as one of them. Benazir Bhutto is a woman of courage and conviction and acknowledged with the International Leadership Award.